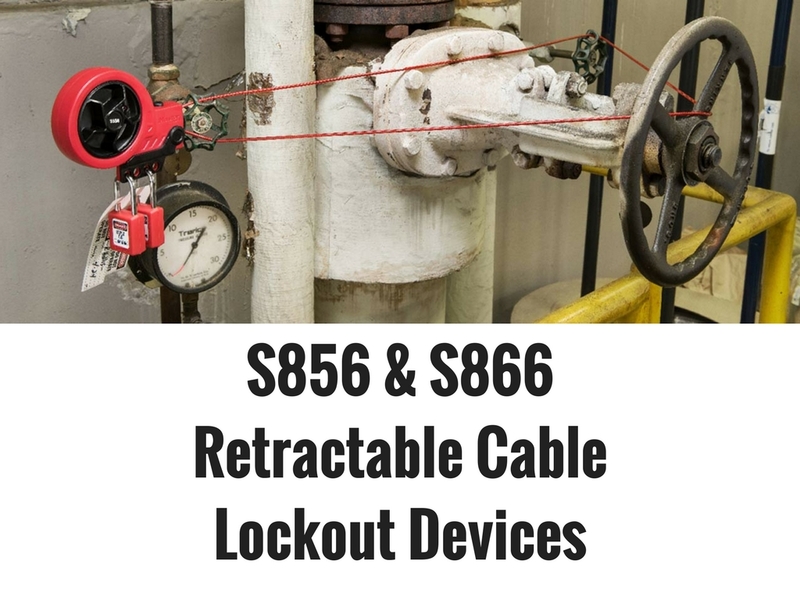 The new S856 and S866 Lockout Devices offer retractable cable devices for lightweight, easy to use, secure safety lockout solutions. Below we’ll highlight some of our favorite new features! The Cable – The retractable cable devices house a 9’ long cable that allows for a variety of applications. Choose a steel core cable or a nylon core cable for your correct application; cables are color coded for quick identification. After looping the cable, the body uses an internal ratcheting mechanism to allow for increased tension to be added once the control lever has been closed, insuring your application is secure. When the time comes, it is easy and affordable to replace your cable as well. The Housing – The rugged ZenexTM Housing stores the cable neatly and allows for a more manageable lockout product, unlike those that do not internally store the cable. The housing helps to protect the integrity of the cable when not currently in use, as it’s ZenexTM Material with great . Each body has a recessed pocket for easy stacking/storage. One of our favorite features is the ergonomic cable reel that allows workers with gloves to easily remove and access the cable. The Control Lever – The control lever must be open to access the release button to set the cable loose. With 4 10mm holes, these new products can be used for group or single lockout applications – whichever is required. The eyelets are perfect size to accommodate most Lock Out Tag Out padlocks. At The Lock People we really appreciate the flexibility of this item to become high security without requiring many additional parts and pieces. Snap in Feature – Click the cable back into the body with the snap in feature; once activated the snap eliminates the ability to add more slack after the lever has been secured. The snap feature secures against tugging, shaking, or wiggling the cable out of position. Replacement Options – Cable replacement is available for both models, if your cable is worn or your application changes you can save time and money by switching the cables rather than repurchasing the full piece of equipment. Extra Features – Each model comes with generic warning tags in English, Spanish, and French and alternate language labels are available for purchase. Color coded stickers allow you to quickly identify which device to use, the S856 stickers are black and the S866 stickers are yellow. Happy Traveling with the New TSA Approved Padlocks!